Hyva’s range of waste handling equipment extends beyond Skip and Hook loaders. 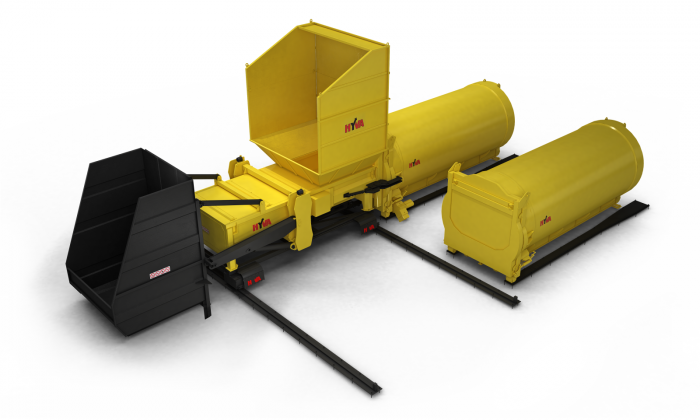 With the aim of being able to offer a complete waste handling package Hyva also manufacture mobile and fixed waste compaction systems and transfer stations. With the ability to be integrated into the basement of an apartment building for an unobtrusive service and a sealed leakfree design Hyva Press is the smart choice for waste handling. The Mobile Compactors (MC) are closed systems to compact and store waste which can be placed at any location and do not require ground fixing or housing in a special building. These compactors have high volumetric efficiency and compaction ratio, rubber seals and power pack with frequency control design. These features deliver many benefits, including: faster compaction; no leakage; better hygiene; higher payload; lower energy consumption; lower noise and, easier maintenance. The MC line comprises three families – the MC060, MC100 and MC150 which have theoretical volumetric capacities of 68, 105 and 125m3/h respectively. Each family has several model variants. And, the new range of compactors can match with different collection methods such as manual carts, tricycles, small tippers, small hook and skip loaders, rear collection vehicles and waste bins. The Micro SC line comprises two families – the SC160 and the larger and more fully featured SC200 which have theoretical volumetric capacities of 154 and 226 m3/h respectively, and, in different container sizes from 6m3 to 12 m3. Each family has several model variants with options to equip the compactor to meet different applications. The Medium SC line comprises two types – the SC260 which can be configured for top and tipcart loading, and, the larger SC350 which can be configured for top loading, with or without push-pit. Each type can be equipped with different container sizes from 16m3 to 28m3. The compactors can match with different collection methods such as manual carts, electrical tricycles, motor tricycles, hook loaders, tippers, micro collection vehicles, rear collection vehicles and skip loaders. And, they can receive different kinds of waste such as paper, cardboard, household, green waste, kitchen waste and light construction waste. More payload – Increased payload is made possible by the lightweight structure and round shape (up to 100% filling) of the container, together with the high compaction force. Better sealing – The system is fully sealed to avoid any spillage or pollution of the environment. New boltable rear door rubber has special sealing feature and is easier to replace. High tensile materials give higher resistance to abrasion. Precision manufacturing of compaction housing and crusher block prevents waste from moving behind the crusher. Increased stability of the compaction created by new U-shaped crusher block and compaction housing, together with new cylinder arrangement. The system can be configured for different types of loading and different container sizes. And, it can be matched to different collection methods and receipt of different types of waste. With all Mega Static Compactor and Transfer Stations being application specific and customised to suit the surrounding infrastructure and utilisation profile, we would be pleased to meet with you and discuss your inquiry further. Please contact us to discuss further. Our fully equipped service facility in Maddington offers you routine, annual, major overhaul and boom maintenance and repairs. Spare Parts Department stocked with a comprehensive parts holding for most major crane brands. We also have the experience to source one off parts.